BCO presents Picassos by Paws Painting Party & Fundraiser. Bring your 4-leggers, grab the 2-leggers and definitely bring the cameras because you are going to want to capture this for posterity. Dogs will be assisted in bringing out their inner Picasso with safe, water based paints and canvases. Every dog paints their own masterpiece and then for a small donation ($10-$20 suggested donation), you can take it home. 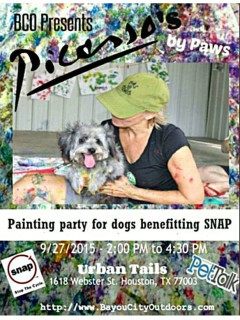 This annual fundraiser for SNAP will be held indoors at the Urban Tails facility and is co-sponsored by PetTalk magazine. You'll go home with a doggy bag of goodies and there will be some doggone good door prizes to be won. Admission is free. Suggested donation of $10-$20.